To MP3 Converter Free accepts and processes more than 200 audio and video formats, including but not limited to: WMA, MP4, M4A, FLAC, WAV, MP4, VID, FLV, AVI, MPG, ASF, MPE, MOV, 3GP, M4V, MKV, MOD, OGM, DV. Please, note: to convert online content, you have to download it to your computer first, using browser or another software. “To MP3 Converter Free” can analyze Bit Rate, Sample Rate and Channels of input files and apply optimal settings to output MP3s. It guaranties the best possible sound quality, saves your time and hard drive space. If you would like to convert to a particular Bit Rate, Channels, etc., just choose required settings in the Preferences. 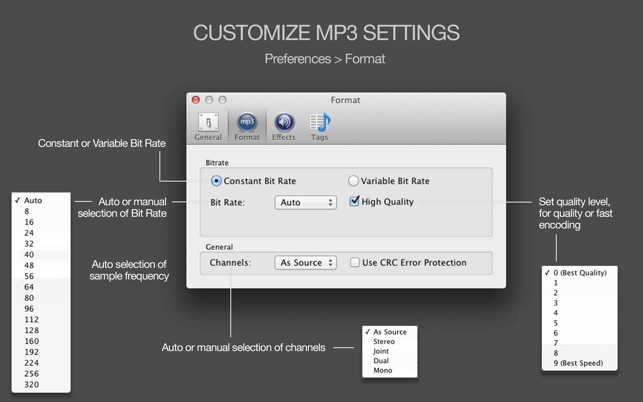 You will enjoy better quality of audio thanks to built-in MP3 normalizer. It enhances too quiet audio files or their parts like music, speech records and voices in movies’ soundtracks automatically. 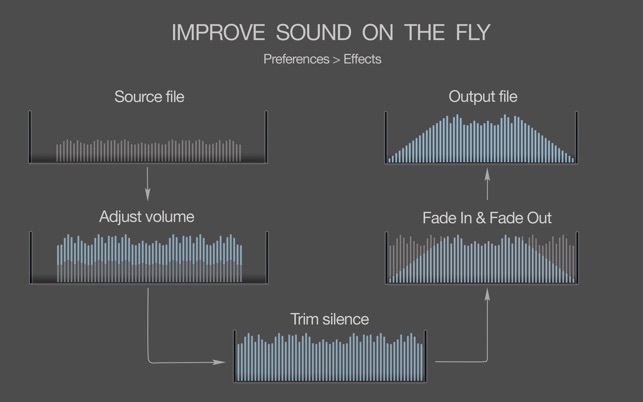 At the same time it will not change already adjusted audio volume. Most audio converters extract just one soundtrack from movies. However, if you would like to extract multiple audio tracks from a video, you have to find special software. 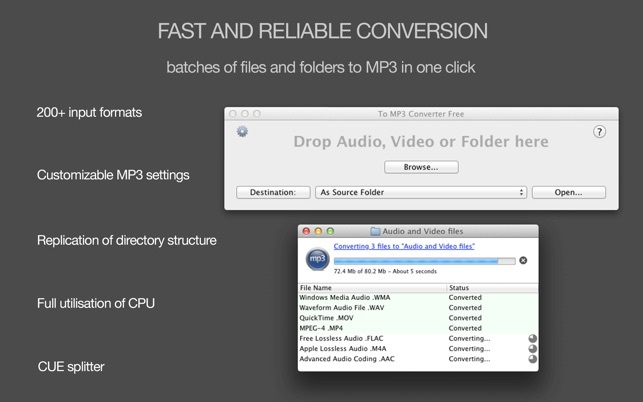 To MP3 Converter Free is an ideal option in such case – it extracts every audio file from a movie. Premium Features subscription is available monthly for $3.99 or yearly for $6.99. Please, email to sup.amvidia@gmail.com about any problems or feature requests. We will try to answer your question within 24 hours. If you like To MP3 Converter Free, a review at the App Store would be very appreciated. *Note: DRM protected audio files (M4P - protected AAC audio files) and VOB files cannot be converted because of the App Store policies. ** Note: We recommend set Bit Rate at 128 or lower number if you are going to burn MP3 files to CD and use it in your car. Many CD car players may not playback MP3 files with Bit Rate higher than 128 kbps. This app. seems great! You ask that I don't post anything at the expense of other developers, so I won't mention any names, but there is a commonly used free audio editor for Mac that is supposed to be able to convert files created on it to .mp3, but only after installing a plug-in made by a different company. I tried downloading and installling that plug-in as instructed several times, and checked out various tutorials and videos about it, but the audio editing program continued to crash whenever I selected it to export the file as an .mp3. So I went online and looked for other apps that would convert the file to .mp3, and found this To MP3 Converter Free app. It had no problem converting the file to .mp3. It seems to be the answer here! I'll keep using that other program for editing, but use yours to produce an .mp3 from the final file. Where do I start? First of all, you cannot get support on this app or the one(s) including this, that are not free. This one is $3.99 a month if you want to convert more than a few albums! 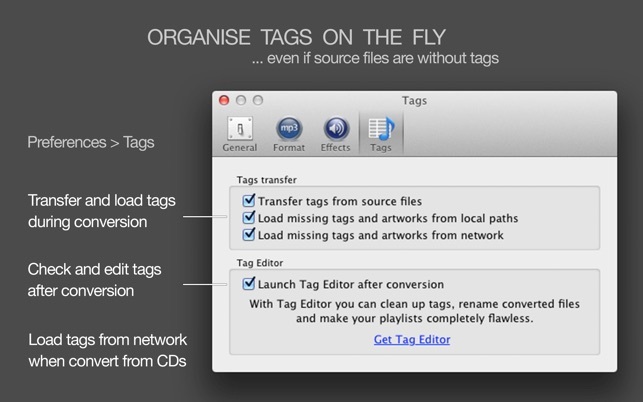 Then they hit you with a fee for editing/saving tags, and then for listing in Finder. So, I paid the first month’s fee, and it took me the better part of two weeks to convert most of my music from backups of former saved music. After a couple of conversions, you get a notice that it can’t find the files. So you go back to the beginning of your backups, and try to remember where you left off after you restart this app. And there we find the files they couldn’t find. This happened so many times I lost count. 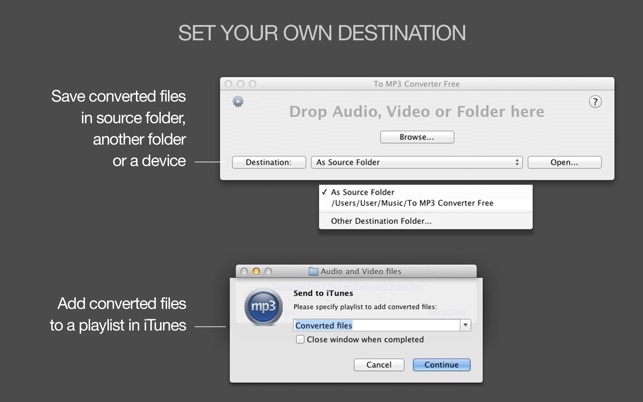 Then it saves the files in two places in iTunes, in the albums and in another place called TO MP3 CONVERTER FREE. Delete one, and it deletes both. The description says you can convert batch files. I was never able to do that. An album, yes; but batch files, no. But finally, after all that, and numerous attempts to get an answer to my issues from their “support” with no response, NONE OF THE ARTISTS SHOW UP UNDER THE ARTISTS’ LIST, and you have to do a search if you are looking for a specific artist. So now my iTunes library is a mess that is beyond me to know how to straighten out, and the SUPPORT DOES NOT RESPOND TO EMAILS. This app is a piece of junk. And, furthermore, I told them to please contact me before I wrote a review, and even that did not get a response. The app was fast and did exactly what i wanted. I paid the dollar so I could do folders instead of just one song. All was great but the only thing is once you sign up you have to cancel before month end or it charges you again. I think they should have explained how to do this or at least where to go. After digging i found out it is through your Itunes account and not through the app. Just go into your Itunes account and you will easily see where to cancel. Other than making me search for an answer, the app was great, and faster than the other one I had tried earlier. Copyright © 2018 Amvidia Limited. All rights reserved.